ALLENTOWN, Pa. (March 4, 2018) — PPL Electric Utilities, bolstered by assistance from hundreds of additional line workers and tree crews, is making significant progress in bringing the lights back on for customers affected by Winter Storm Riley. As of 8 a.m. Sunday (3/4), about 137,000 customers had power restored and about 54,000 remained out of service. The eastern part of PPL’s service area was the hardest hit and contains the bulk of the remaining outages. Counties with the most remaining outages include Lehigh, Northampton, Bucks, Monroe, Pike and Wayne. PPL is recalling about 25 linemen now doing storm restoration work in Puerto Rico so they can help restore customers to power in Pennsylvania. Also assisting PPL are 100 contractors provided through PPL’s sister utilities in Kentucky – Louisville Gas & Electric and Kentucky Utilities. In addition, we expect another 250 line workers to arrive today and tomorrow from utilities as far away as Florida, Texas, Ohio and Alabama. This storm will rank among the 10 worst to affect PPL customers. 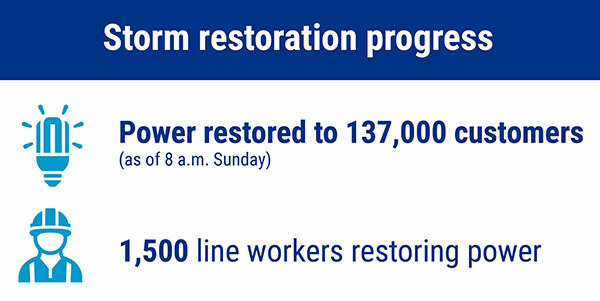 The following estimated restoration times for various regions of our service territory. It is important to note that most customers in these areas will have power restored well in advance of the stated times. Customers will receive updated restoration alerts when crews arrive to begin repairs that will restore their service.